← Where’s Dustin Hoffman when you need him? Back in December of 2010 I was visiting Taiwan for the second time, seeing the southern parts of the country that I had missed on my first, typhoon–riddled visit. I had started the trip at Tarako Gorge, where I had hoped to see some macaques up close , but the closest I got was seeing one from the tour bus. After sharing my dissapointment with my friends and family I was bombarded by stories of how lucky I am that I did not see a monkey in real life. According to some of my family, in-person encounters with wild primates lead to stolen shiny things, personal injury and other unspecified traumas. I will admit, even with these warnings, I was still disappointed. I concluded the trip in Kaohsiung, taiwan’s second largest city. I liked Kaohsiung a lot, but the weather was a bit windier than I was comfortable with. Have you ever strolled a street lined with palm trees on a blustery day? Don’t. It sounds like a fun game, but dodging coconuts is less amusing in reality. I veered away from my planned route in an effort to avoid a death befitting Wile E. Coyote. In fact, I altered my route so dramatically that I decided to change some of plans entirely. Looking at the map I saw that I was now a relatively easy walking distance from Shoushan, or Ape Hill. I seized the opportunity and walked towards the park. When I arrived, I saw these guys guarding the entrance. I knew that there were monkeys living in the park but I misunderstood the exact situation. 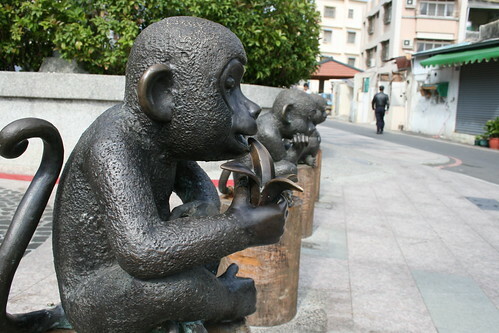 I thought that the monkeys on Shoushan would be like the moose in Algonquin Park: numerous and not an uncommon sight, but happy to avoid humans when possible. I was wrong. 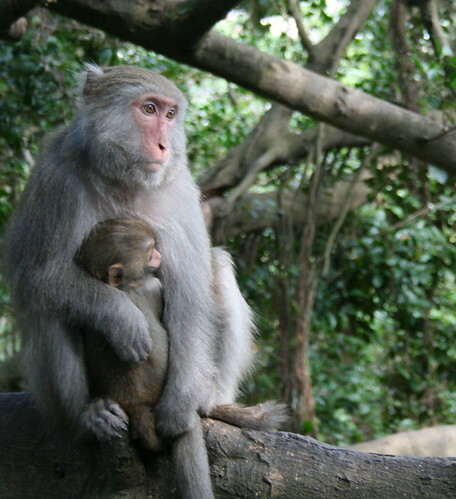 The macaques on Shoushan were more like the (former) rabbits at Uvic: everywhere and surprisingly fearless. Before entering the park I had throw out my food and carefully stashed my camera inside my backpack. I even removed my watch and earrings. I was determined to avoid a monkey mugging. My overly-cautious ways paid off. As I walked through the park, alongside the other tourists, I did not once get attacked by a macaque. Although that might be due to the fact that I am not a giant banana. At one point I got a bit more confident and I stopped to take my camera out of my backpack and throw it around my neck. I walked, with a death grip on my camera, for a few more minutes, not quite daring to raise the camera to actually take a picture. But then I came to a bend in the path with a group of people. When I approached the group I saw that they were watching a mother and baby macaque, happily sitting on branch about six feet from the footpath. I really wanted a picture but I was really afraid of upsetting the mother. So I stood still while other people came and left, taking pictures. Eventually the crowd thinned a bit and I decided that the mom looked pretty happy. She had been watching the crowd watch her for quite a while and she did not seem at all alarmed. And that’s the story of how I crossed off “see a monkey (or macaque) in the wild” from my bucket list. You can never have too many monkeys! Great post.